The bees and I are not liking this cold weather. I leave for work when it’s freezing cold and just light, and come home in the pitch dark, so weekdays are out for any bee activity. I can only hope for dry, semi-warm weekends to get things done. I’m realizing the importance of a yearly schedule and having a plan in place well beforehand. Being a newbie, I’m always thinking and rethinking about the bees – usually around 2 am, which doesn’t make for a good night’s sleep. We had a brief warm snap last weekend when temps pushed up into the mid-50’s, so I took the opportunity to lay lots of candy across the top frames. 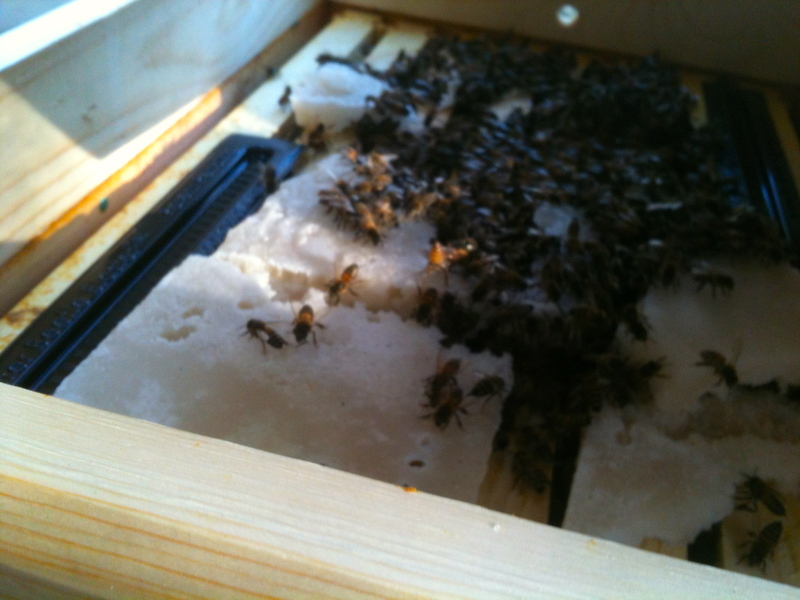 When I opened Yellow Hive 2 (YH2), the number of bees appeared to be dramatically reduced. Not good at all. Of course, it was too cold to dig in and see what the problem might be. Queenlessness is always my first fear, which in this weather means the hive will likely die. Even if they do produce another queen at this point, there aren’t any drones left to mate with her, so reproduction will stop and the bees will gradually die out. I’ve continued finalizing my plans for the internal hive configuration. Better late than never, I hope. Winter is a scary time for a beekeeper. You can’t get into the hives to see what’s going on. It’s cold outside, so the bees stay inside – there’s no outside activity to tell you what’s going on. It’s easy to imagine the worst, that condensation is building up and collecting on the bees, or they’re dying out from losing their queen, or they’re starving because there aren’t enough stores, or they’re being infested by mites or wax moths or wax beetles. No matter, you just sit tight and hope you’re doing the best you can do for the girls, and wait for another warm snap to hit so you can get out and check on them. Exterior wind barriers covering the back and sides. These seem to be working well, and they extend below the bottoms of the hives to prevent too much wind from going up through the bottom screens. 2. I added bottom boards on YH2 and Green Hive 1 (GH1). 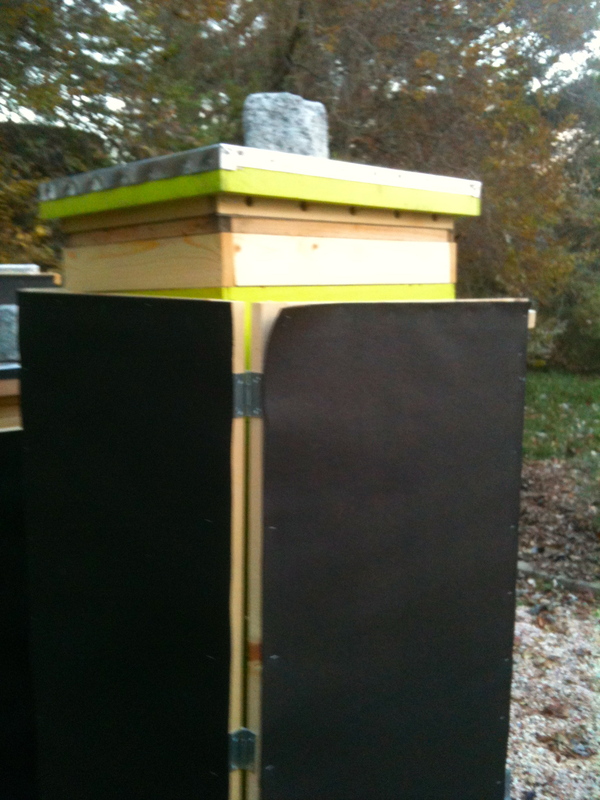 BH3 is a home built hive and doesn’t have a slot for adding the mite board, so the screened bottom board is left open. 3. 2 inch high spacer frames are added onto the top hive body with a top entrance drilled into the front for ventilation and an upper exit. 4. The top inner cover is flipped so the shim side is down, and I stapled fine metal screen across the hole so the bees can’t get to the top of the hive. 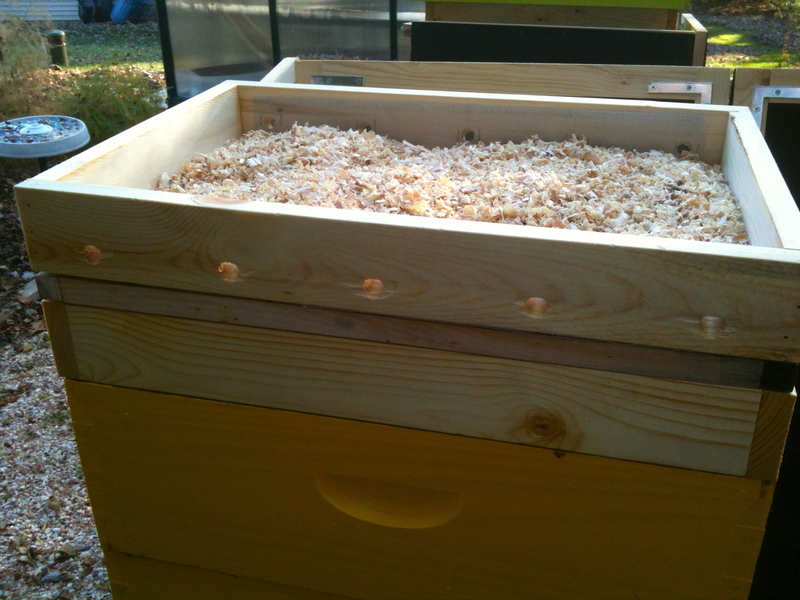 This also provides another top entrance and allows for more ventilation in the hive. 5. The hubster made some great ventilation spacers to add above the inner cover and beneath the top telescoping cover. The bees cannot get into this box. 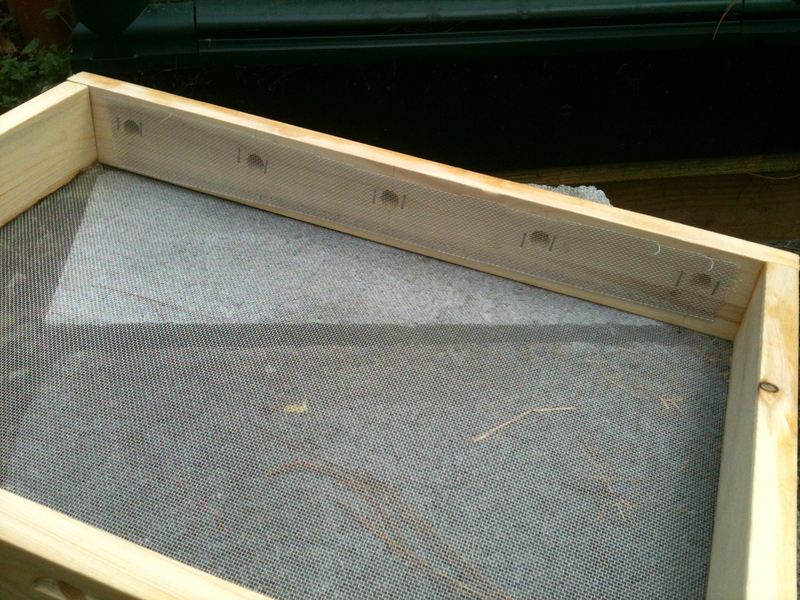 The holes on the sides are drilled upwards to prevent rain water from entering the box. The holes are positioned just beneath the outside rim of the top cover, which extends out from the holes to keep water out. 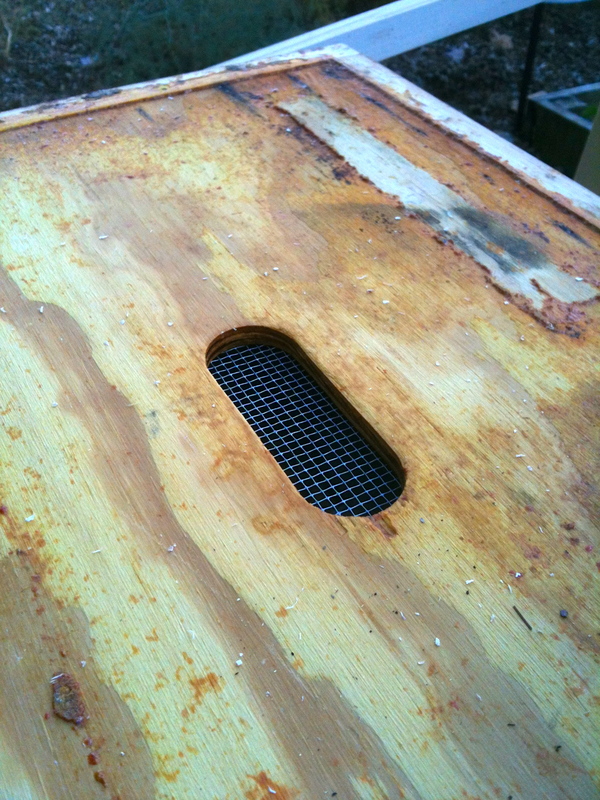 1/2 inch ventilation holes were drilled on two sides then covered with mesh on the inside to prevent bees from entering the box and to keep critters out. 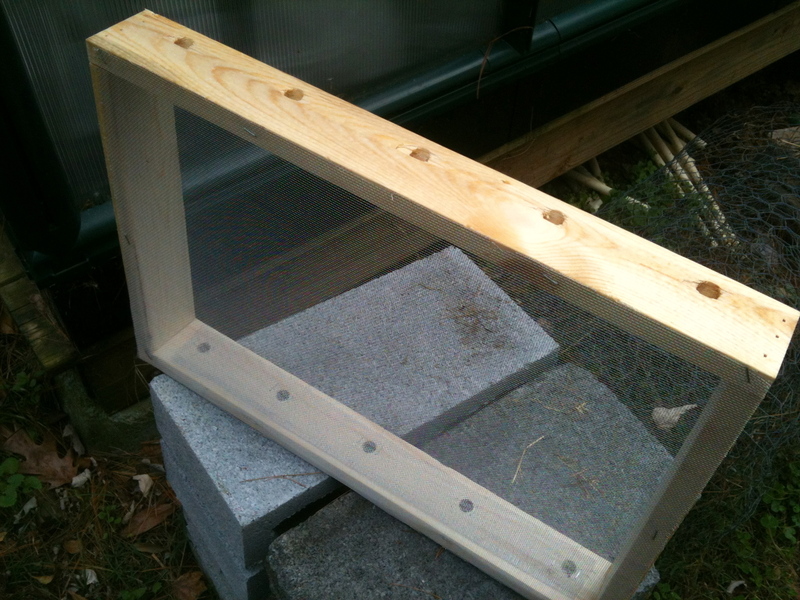 Window screen was stapled to the bottom of the frame to allow it to hold wood chips. 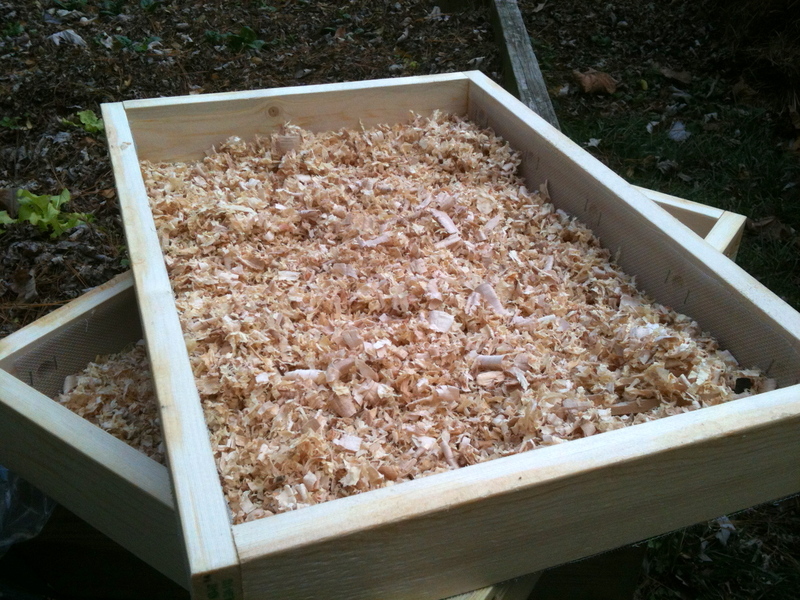 The wood chips will help absorb moisture from the condensation. I know I said I wouldn’t open the hives and expose the girls, but I couldn’t resist taking a peek. All three hives, including YH2, are full of bees on top devouring the candy. I’m feeling much better now about closing them up and letting them go til the next warm day comes and I can add more candy. Til then, I have a few good beekeeping books sitting on my bed stand. Never to early to start preparing for spring! Enter your email address to follow Boo Bee Honey and receive notifications of new posts by email.